PT Electronics it is one of the leader among the Russian electronics distributors. Supply chain includes products of more than fifty worldwide electronic components producers. 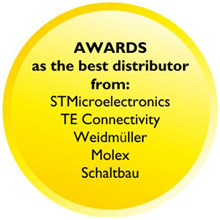 Such world leading vendors as STMicroelectronics, TE Connectivity, Weidmüller and many others are in our partners. Continually improved quality management system is the one of PT Electronics key priorities since company foundation. 21 Dec Power supply desing is easy now with STMicroelectronics eDesign simulation tool!